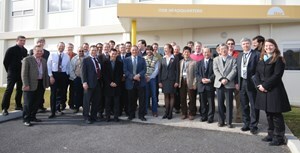 The team that keeps a close look at ITER's in-vessel diagnostic systems. This week, experts from the various teams inside the ITER Organization, its Domestic Agencies in Europe, Korea, Japan, Russia and the US, plus external experts from JET, IPP- Greifswald and RFX Padua assembled in ITER Headquarters in Cadarache to review ITER's in-vessel diagnostic systems. "The aim of the meeting was not only to inform all the parties involved on the recent design updates - something that has an impact on the integration and design of our diagnostic systems - but also to track the design progress made at the Domestic Agencies," says Anna Encheva, Engineer in the Diagnostics Division, who organized and co-chaired the three-day meeting. The attendees focused particularly on all the diagnostic in-vessel services such as cables, conduits, connectors and feedthroughs with the goal of identifying outstanding issues and reviewing their integration with the vacuum vessel and the blanket instrumentation. At the end of three days, a list of outstanding issues were identified and grouped into global ITER-related and specific diagnostics-related action items that will be tracked down over the next weeks and months.